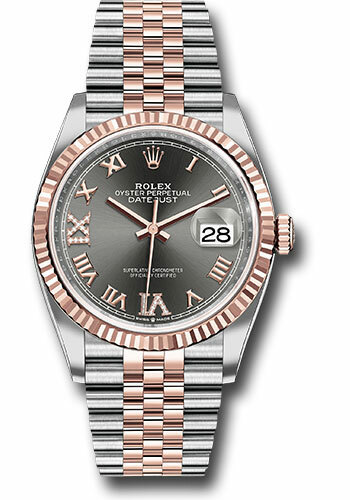 36mm Everose Rolesor case with Oystersteel monobloc middle case, screw-down steel back, screw-down 18K Everose crown, 18K Everose fluted bezel, dark rhodium dial, Roman numerals with diamond set 6 and 9, Rolex calibre 3235 self-winding movement with date at 3 o'clock, approximately 70 hours of power reserve, Everose Rolesor Jubilee bracelet with five-piece links, folding Oysterclasp buckle with Easylink 5mm comfort extension link. Waterproof to 100 meters. Redesigned for Baselworld 2018 with updated case sides, lugs, and calibre 3235 movement.